Hannover, Germany, April 1st, 2019 – RoboticsX GmbH, a German high-tech company, specialized in advanced software for industrial robotics and automation, today announced a new solution in the field of industrial intelligence. The manufacturing software platform X1 GRID™ announced at Hannover Messe 2019 is infused with IBM Watson IoT and Cloud technology and ready to unlock new value for the production world. “RoboticsX delivers clean and transparent source data from industrial systems. When it comes to data analytics there is no better partner for RoboticsX than IBM with its array of services”, added Boras. “Closed ecosystems such as manufacturing environments are seeing great progress, fueled by machine learning and artificial intelligence technologies. Machines are actually learning. AI also helps companies design better virtual factories before putting them into the real environment”, concluded Boras. Die deutsche Robotics-X GmbH, mit Sitz in München, hat ein neues Forschungs- und Entwicklungszentrum in der slowenischen Hauptstadt Ljubljana eingeweiht. Die Einrichtung namens Area X-1 ist das neue Entwicklungszentrum für Industrie-4.0-Lösungen mit Fokus auf intelligente Roboter und hoch entwickelten Automatisierungslösungen für die Industrie. Gleichzeitig mit der Eröffnung des neuen Robotics-X-Zentrums wurde die offizielle Ankündigung der Vertragsunterzeichnung zwischen Robotics-X und Yaskawa Europe über die Entwicklung von Industrie- 4.0-Lösungen bekanntgegeben. Robotics-X wird in Zukunft standardmäßige und kundenspezifische Lösungen für Yaskawa-Kunden entwickeln. RoboticsX GmbH, München based German company, status quo challenger, determined to disrupt manufacturing and the way how products are created, opened new research and development (R&D) center in Ljubljana, the capital of Slovenia. The new facility, called Area X-1, will serve as a development center for Industry 4.0 solutions, focused on smart robots and advanced industrial automation solutions. Opening of the new RoboticsX facilities coincided with official announcement of signed contract between RoboticsX and Yaskawa Europe, to develop Industry 4.0 solutions. RoboticsX will develop standard and custom-made solutions for Yaskawa customers. "I am satisfied that we have realized the next big and important step for RoboticsX company, expanding R&D operations from Germany also to Slovenia. Our future outlook is more than optimistic and we will make sure that our solutions are at the forefront of the industry and pave the way to smart manufacturing", said Peter Boras, founder and CEO of RoboticsX. "I'm proud of the RoboticsX team and the work it has done so far. Even the most demanding tasks were done exceptionally. We are happy to work with such a motivated team, as their motivation and drive are contagious", added Bruno Schnekenburger, former President of the Robotics Division, now Board member COO at Yaskawa Europe. 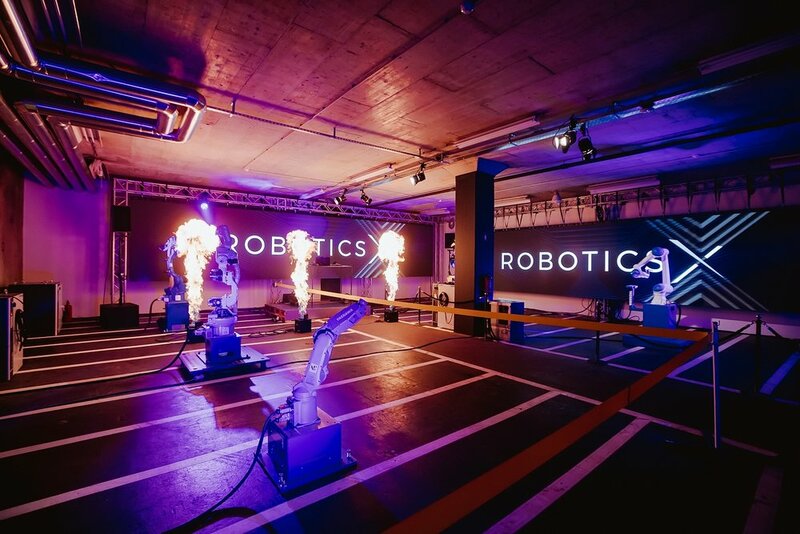 At the opening ceremony, representatives of RoboticsX showed the attendees advanced solutions for robotic welding, coupled with artificial intelligence, machine learning, and big data analytics. "We are developing solutions for the manufacturing of tomorrow. By upgrading industrial robots with smart and connected solutions, we are increasing their performance and efficiency, while reducing operating and maintenance costs. Today, every production company that wants to remain competitive in the future has to think about introducing smart robots in its manufacturing processes", added Rok Prešeren PhD., co-founder and CTO at RoboticsX. The new „YASKAWA Cockpit” – the core of YASKAWA’s i3-Mechatronics Industry 4.0 solution for Robotics, Drives, Motion and Control products has been shown to the public for the first time at Hannover Fair 2018. RoboticsX, a young German High-Tech company supported YASKAWA for engineering and software development of the new YASKAWA Cockpit.